The idea of integral mission has risen to become a guiding star in the worldwide Body of Christ. But many are unsure of its biblical and theological foundations. 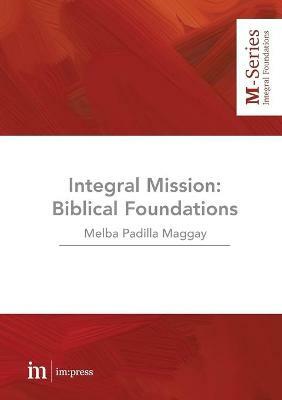 In this series of studies, Melba Maggay explores the implications of classic Scripture passages from a Filipino contex... read full description below. ... we are hearing a call to a fresh understanding of what it means to follow Jesus in our world. From its origins among Latin American theologians, the term 'integral mission' has become a widely-accepted way to describe the totality of God's mission in the world. It is used to express the ways of serving the whole person, making no distinction between spiritual, social, physical and mental, exemplified in the life and ministry of Jesus of Nazareth. In order to become mature co-builders of the Kingdom of God, we need to grasp the Biblical basis for integral mission, and re-discover the challenge and calling of discipleship.Noted Filipino activist and social commentator, Melba Maggay, writes from a Global South viewpoint in her expositions of three key Scripture passages. Together they provide that 'fresh understanding' of the life in its fullness that is our promise. Dr. Maggay uniquely combines academic expertise with a certain artistic flair and a leadership gift that brings people together for a common vision and enterprise. As a writer, she shifts easily from technical to creative writing, having won top Palanca literary prizes in English essay writing as well as in the zarzuela category of the 1998 National Centennial Literary Competition, commemorating 100 years of Philippine independence. As founder and longtime director of Institute for Studies in Asian Church and Culture (ISACC), she had been cited for her outstanding leadership in organizing the evangelical Protestant presence at the EDSA barricades during the February People Power Uprising in 1986. Dr. Maggay started her rather unusual career with a brief stint as cub reporter for the old Manila Chronicle, where she had hardly warmed her seat when martial law was declared and the newspaper was shut down. She shifted to serving as speechwriter and technical consultant for both the Minister and Deputy Minister of Labor, and, later, the Minister of Human Settlements, mostly doing research and writing policy speeches. By 1978 she had felt ready to obey a call to respond to the crisis posed by authoritarianism. Along with her friends, she founded ISACC and saw its growth as a conscientizing voice in politics and in church-and-culture issues. She played a leading part in the activism of the Filipino evangelical community in opposition to the Marcos regime, culminating in the EDSA revolution of early 1986. In 1991 she stepped down from its leadership and hands-on management to specialize in the more technical aspects of its work in cross-cultural and social transformation studies.